This is a very strange book, but Alice Hoffman is such a great writer that you just have to read the whole thing anyways. Kind of a modern more disfunctional Wuthering Heights sort of a story. Hoffman's powers of enchantment increase exponentially in each of her cosmically romantic novels. 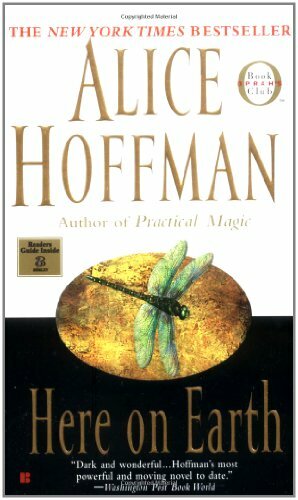 Just as she did in Practical Magic (1995), Hoffman depicts love as a disturbance in the field, but here it is manifested as an unpredictable force of nature that encompasses all extremes, from the chilling pall of winter to the life-and-death properties of fire. Richard, March's sweet but distracted husband, should not have let her return to their small New England hometown with only their teenage daughter, Gwen, for company. He should have known that when March left for the haunted terrain of Fox Hill, she would meet up with Hollis, the jealous and angry boy-man with whom she was so deeply in love as a young woman. Hollis transformed himself from a resentful charity case into a millionaire but left death and despair in his wake and achieved no joy through his success. And he's still obsessed with March, who slips right back into the confines of their passion because Hollis possesses the sort of power that makes women cling and submit. Hoffman walks a fine line between bodice-ripping trash romance and bewitching but intelligent fiction here, but her fluency in the language of the heart and the bruised tenderness of her prose lift her far above cliche, into a luminous realm where the souls of her poignant characters open like moonflowers. Donna Seaman --This text refers to an out of print or unavailable edition of this title. I'm not sure about this one but I'll give it a go. Took the book to the meetup at Cravings today. Picked this up at the July book crossing meeting. I can't say that I enjoyed this book. The characters were not very likable and I found it difficult to understand the situation. Having said that Alice Hoffman did draw me into the story and kept me reading to the end. Taking this to the April BookCrossing meeting to be enjoyed by the next reader. Picked this up at today's BookCrossing meeting at Cravings. No back problems carting home books today!!! Hard to pick up as didn't like the cover or the title. Eventually, the Bingo game made me pick it up. Read it until the end. Disturbing story, didn't really like the characters - EXCEPT I started to like Gwen. I liked March less as the story moved on. It kept me reading though.